We’ve prepared something really special for the final evening of our TRUMPET DAYS! 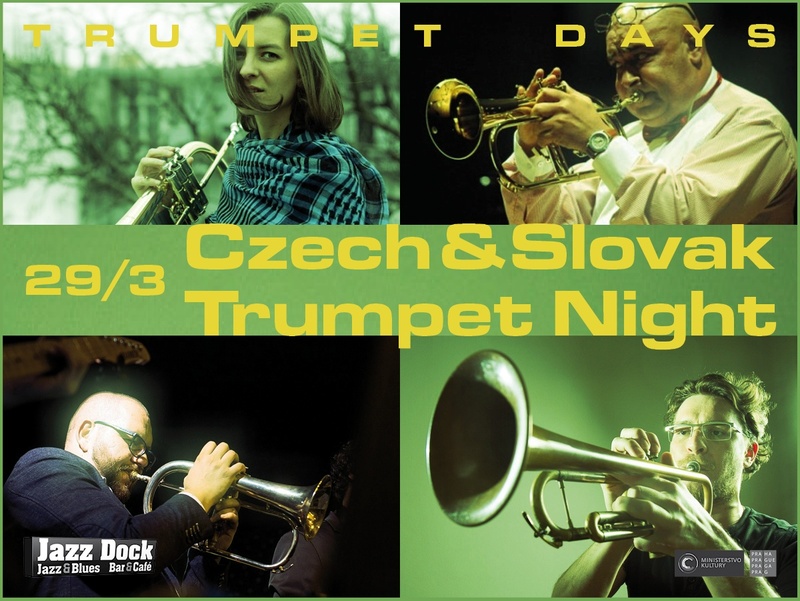 Four leading Czechoslovak trumpet players will perform at Jazz Dock! First up will be Oskar Török, well known on the Czech music scene from Vertigo and Čikori Iva Bittová. He is also a member of the Polish group Wojtek Mazolewski Quintet, which has recently won a platinum record and is one of Europe's top jazz ensembles. Štěpánka Balcarová has been recognized in the last few years as the leader of Concept Art Orchestra, where she is conductor, arranger and composer. This time she will show her art with her band 4step. Miroslav Hloucal is considered one of the best trumpeters in the Czech Republic and plays with numerous modern jazz bands (Big Band Gustav Brom, Ondřej Štveráček Quintet, Points or Lanugo, Infinite Quintet or Bucinatores Orchestra). The legendary Julius Baroš, boasting a fifty-year jazz career, will top off the evening with his quintet. From a long list of accolades, he is known for his collaborations with Laco Deczi, Štěpán Markovič and many Prague big bands. He has also been a longtime member of the FISYO Film Symphony Orchestra. His music is inspired mainly by the jazz of the 1950s and 1960s. Whole evening admission: seating CZK 400, standing CZK 250. Seats reservation is possible only if you buy a ticket. Thank you for understanding.